It is one of the rarest, most isolated and least frequented travel destinations on the planet. The South Pole is cold, bitterly so. Antarctica's interior is the coldest place on earth. Temperatures have dropped as low as -89°C (129°F) in the austral winter. It can be quite windy. Occasionally gale force winds exceed hurricane statistics. The locale's three kilometer (two mile) altitude could cause altitude sickness. And, whatever the medical emergency, the South Pole could be inaccessible to outside help. Except for the station's structures, vehicles and inhabitants, there's little to see but a monotonous white landscape. The cost of visiting the South Pole will derail most budgets. 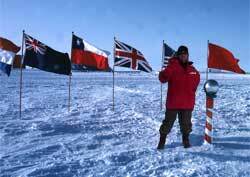 But, all said, the adventure of experiencing the South Pole is priceless.